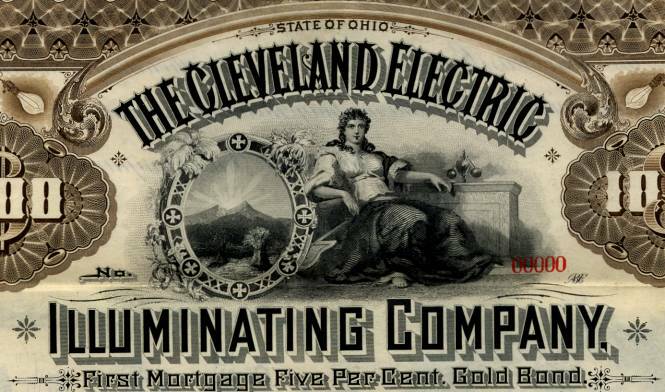 Beautiful specimen certificate from the Cleveland Electric Illuminating Company printed in 1898. 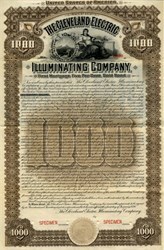 This historic document was printed by the Franklin Lee Bank Note Company and has an ornate border around it with a vignette of an allegorical figure, and is over 115 years old. 60 coupons attached on top. Cleveland Electric Illuminating Company (CEI), a subsidiary of FirstEnergy Corp. (NYSE: FE), serves more than 750,000 customers across Ashtabula, Cuyahoga, Geauga, Lake and Lorain counties. FirstEnergy is a Fortune 500 company headquartered in Akron, Ohio. It serves 4.4 million customers, providing electric power, natural gas, and steam distribution services to parts of Ohio, Pennsylvania and New Jersey. FirstEnergy's utility customers are served through seven operating companies: Cleveland Electric Illuminating, Jersey Central Power and Light, Metropolitan Edison, Ohio Edison, Pennsylvania Electric Company ("Penelec"), Penn Power, and Toledo Edison.